Solar/Eclipse Glasses: you can purchase these little glasses from many online store (Amazon.com and OPT Corp just to name a few). Prices range from $3 to $15. Telescope Solar/H-alpha filters: If you own a small telescope, it is likely there is a solar/H-alpha filter that can be fitted for your scope. It is a nice way to view the eclipse. And if you are into astro-photography you could even take a few snapshots or videos of the eclipse (see example here). Solar filters for scopes can really range in price, so this method would probably be the most costly. Binoculars: If using binoculars, make sure to use a proper solar filter just as you would for a telescope. Many online stores will carry such filters as well. Or wear your solar/eclipse glasses and then use the binoculars over them. Note: any kind of filter that you use (glasses, H-alpha, etc), unless pointing at the sun, you will not be able to see anything through it. If you can see something other than the sun, they it is probably not safe for solar viewing! Pinhole Projectors: There are many ways to project the sun’s image via a pinhole, but the basic idea is to take 2 white pieces of stiff paper/cardboard. Using a pin, puncture a whole in one of the papers. Place the pinhole paper in the path of the sun and hold the other paper behind it to project the sun onto it. Adjust the distance between the papers until projected image is to a satisfactory size/focus. What you see on the projected paper is the actual image of the sun and not just a dot of light coming through it! NEVER LOOK DIRECTLY AT THE SUN! Looking directly at the sun can damage your eyes and/or lead to blindness. Using sunglasses or other filters not specifically designed for viewing the sun is NOT ENOUGH. 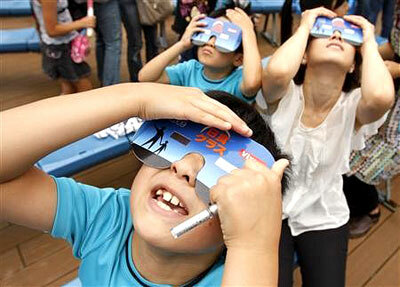 USE the solar glasses to look at the sun. DO NOT view the sun through unfiltered binoculars or telescopes. Please watch your children very carefully. Educate them about safe solar viewing.